by Gwen Sharp, PhD, W & W Norton and Company Publishers, February 25, 2009. The counties with a dot indicate that 50% or more of residents belong to the dominant denomination. Unsurprisingly, we see that the South is dominated by Baptists (which includes Southern Baptists). The relatively high prevalence of Lutherans in the upper Midwest is due to the large number of Scandinavian Lutherans who settled in that region in the late 1800s and early 1900s. by ANDY KIERSZ, Business Insider Magazine, MAY 21 2015. The US Census Bureau just released estimates of the population in every town, city, and village in the United States as of July 1, 2014. 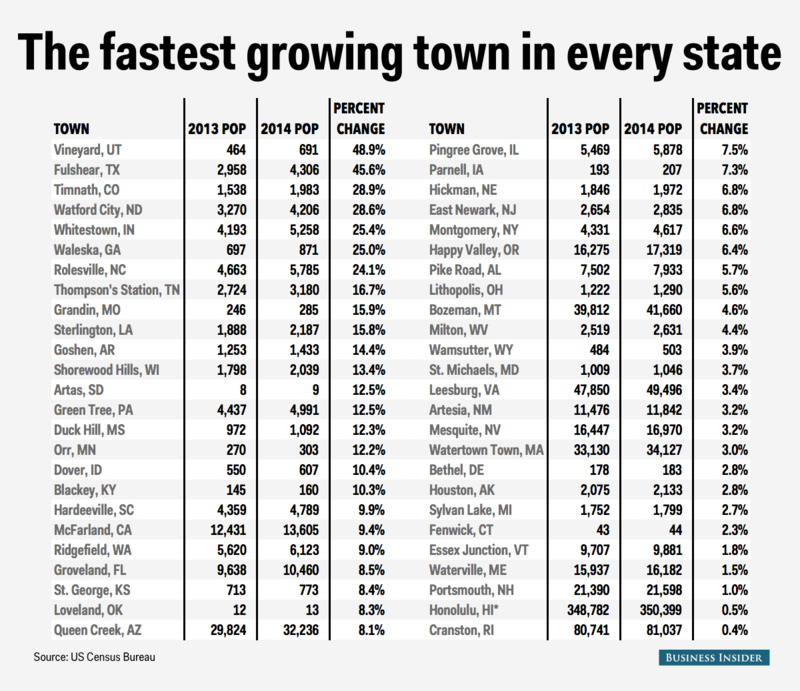 Using those estimates, we found the town in each state with the largest per cent increase in population between 2013 and 2014. 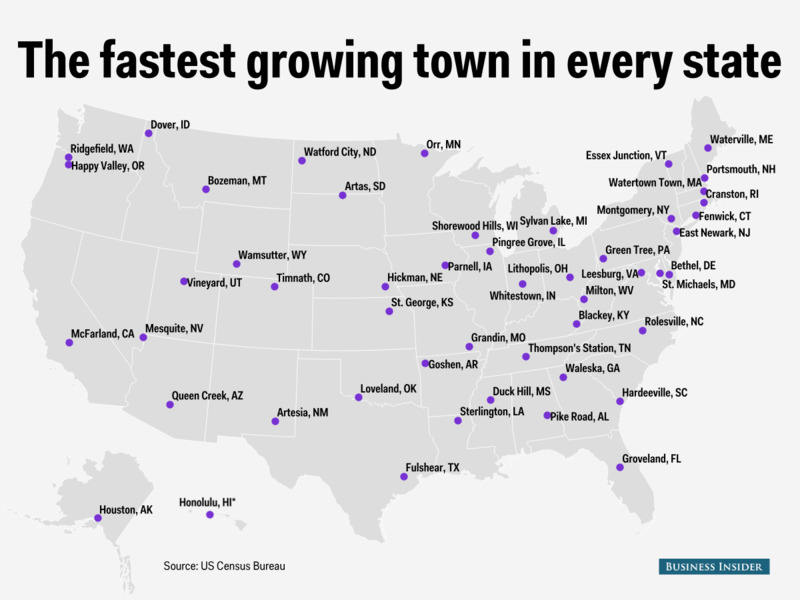 There’s an asterisk next to Honolulu, and this is because that city is the only town in Hawaii measured by the Census Bureau, making it win by default. BY D’VERA COHN, Pew Research, 6/19/15. The Census Bureau is experimenting with new ways to ask Americans about their race or origin in the 2020 census – including not using the words “race” or “origin” at all. Instead, the questionnaire may tell people to check the “categories” that describe them. Census officials say they want the questions they ask to be clear and easy, in order to encourage Americans to answer them, so the officials can better collect race and Hispanic data as required by law. But many people are confused by the current wording, or find it misleading or insufficient to describe their identity. Census forms now have two questions about race and Hispanic origin. The first asks people whether they are of Hispanic, Latino or Spanish origin, and states that “Hispanic origins are not races.” A second question asks, “What is this person’s race?” and includes a list of options with checkboxes and write-in spaces. The U.S. government defines Hispanic as an ethnicity, not a race. The problem with using the word “race” is that many Americans say they don’t know what it means, and how it is different from “origin.” The agency’s focus group research found that some people think the words mean the same thing, while others see race as meaning skin color, ancestry or culture, while origin is the nation or place where they or their parents were born. 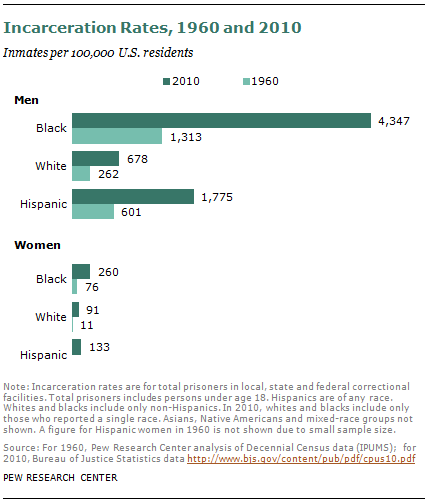 AMERICAN CENSUS CATEGORIES FOR RACE & ETHNICITY IN AMERICA. *The U.S. Census Bureau does not consider Hispanic/Latino identity to be a race. Ethnicity is asked as a separate question. See Chapter 7 of “Multiracial in America” report for more details. 1960 onward: People could choose their own race. 2000 onward: Americans could be recorded in more than one race category on the census form. BY ANNA BROWN, Pew Research, 3/12/15. The nation’s foreign-born population is projected to reach 78 million by 2060, making up 18.8% of the total U.S. population, according to new Census Bureau population projections. That would be a new record for the foreign-born share, with the bureau projecting that the previous record high of 14.8% in 1890 will be passed as soon as 2025. Yet while Asian and Hispanic immigrants are projected to continue to be the main sources of U.S. immigrant population growth, the new projections show that the share of the foreign born is expected to fall among these two groups. Today, 66.0% of U.S. Asians are immigrants, but that share is predicted to fall to 55.4% by 2060. And while about a third of U.S. Hispanics (34.9%) are now foreign-born, the Census Bureau projects that this share too will fall, to 27.4% in 2060. These declines are due to the growing importance of births as drivers of each group’s population growth. Already, for Hispanics, U.S. births drive 78% of population growth. By SABRINA TAVERNISE, May 17, 2012, New York Times. WASHINGTON — After years of speculation, estimates and projections, the Census Bureau has made it official: White births are no longer a majority in the United States. Non-Hispanic whites accounted for 49.6 percent of all births in the 12-month period that ended last July, according to Census Bureau data made public on Thursday, while minorities — including Hispanics, blacks, Asians and those of mixed race — reached 50.4 percent, representing a majority for the first time in the country’s history. Such a turn has been long expected, but no one was certain when the moment would arrive — signaling a milestone for a nation whose government was founded by white Europeans and has wrestled mightily with issues of race, from the days of slavery, through a civil war, bitter civil rights battles and, most recently, highly charged debates over efforts to restrict immigration. by Brad Plumer The Washington Post,August 28, 2013. … My colleague Michael A. Fletcher published a big piece … noting that the United States hasn’t made much progress in closing the economic chasm between blacks and whites since the March on Washington 50 years ago. It’s an excellent story, worth reading in full. It’s also worth charting. A recent report from the Economic Policy Institute (EPI) notes that this gap hasn’t closed at all since 1963. Back then, the unemployment rate was 5 percent for whites and 10.9 percent for blacks. Today, it’s 6.6 percent for whites and 12.6 percent for blacks. This chart comes from a recent Census report on income and poverty. Note that just about everyone’s seen a decline in real household income since 1999. 4) In fact, the wealth disparity between whites and blacks grew even wider during the Great Recession. “The wealth gap between minorities and whites has not improved over the past three decades,” reports the Urban Institute. 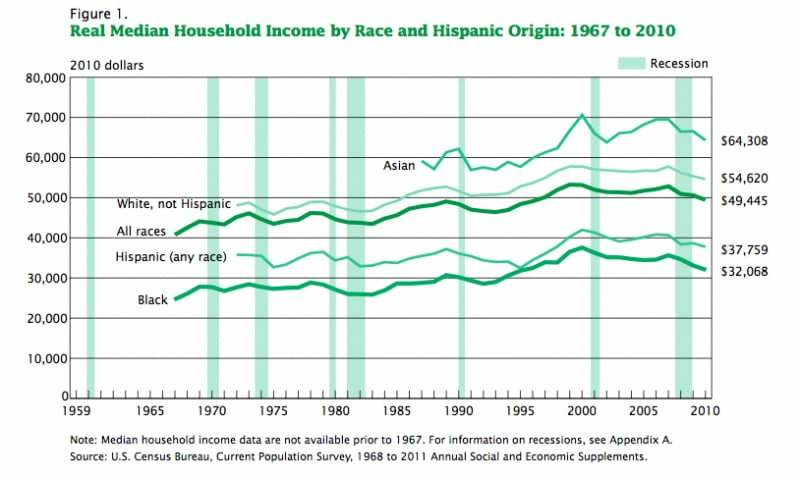 “From 1983 to 2010, average family wealth for whites has been about six times that of blacks and Hispanics — the gap in actual dollars growing as average wealth increased for both groups.” And the Great Recession exacerbated that gap, as blacks and Hispanics were hit especially hard. 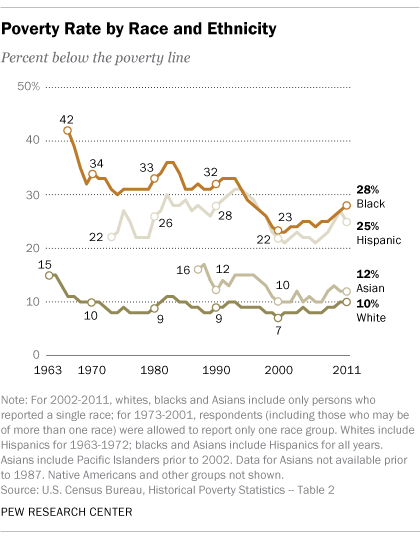 Black poverty fell quickly between 1959 and 1969, from 55.1 percent to 32.2 percent. But after that, the drop was slower and more uneven. In 2011, 27.6 percent of black households were in poverty — nearly triple the poverty rate for whites. “Arrested progress in the fight against poverty and residential segregation has helped concentrate many African Americans in some of the least desirable housing in some of the lowest-resourced communities in America,” the EPI report notes. “Although the share of black children in segregated schools had dropped to 62.9 percent by the early 1980s, the subsequent lack of commitment by the federal government and multiple Supreme Court decisions antagonistic to school desegregation have led to a reversal,” notes EPI. The chart above comes from a recent report by the Kaiser Family Foundation, which notes that the Affordable Care Act could shrink the gap: “The large majority of uninsured people of color have incomes that would qualify for the ACA Medicaid expansion or premium tax credits for exchange coverage.” That said, a lot depends on how many states decide to expand Medicaid coverage under the new law.